"Give Real Change" meters are located throughout downtown and now at the Spokane International Airport as well. City leaders are pushing ahead with two programs they hope will provide meaningful assistance to people experiencing homelessness and living on the streets in Spokane. 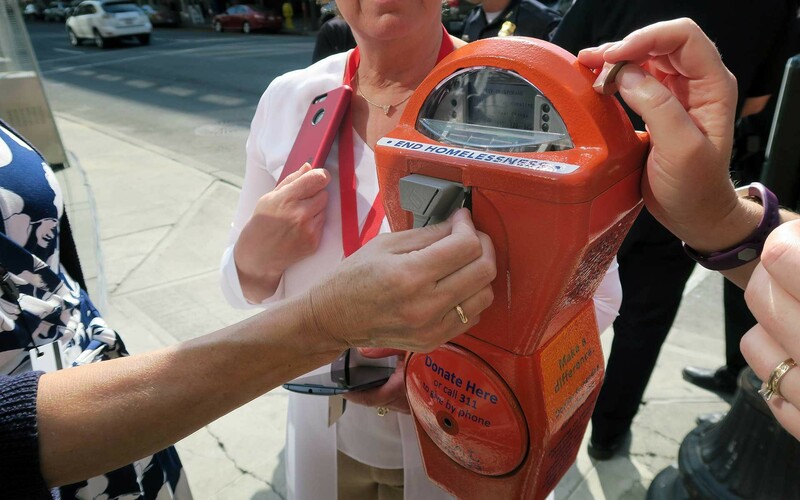 The city's "Give Real Change" campaign, which is already active, hopes to redirect well-meaning donations away from panhandlers and into designated bright-orange city meters. On Tuesday, the city announced it has added more locations for people to donate to the program, which will direct the money toward the city's investment in a 24/7 shelter system run by outside organizations. Give Real Change meters (which take coins or card) are located downtown, and now also in the STA Plaza and at both screening checkpoints at the Spokane International Airport. “As a partner through the City's co-ownership of the airport, the Spokane Airport Board fully supports the Give Real Change initiative,” said Larry Krauter, CEO of Spokane Airports, in a city announcement about the new containers. “We hope that voluntary contributions from the generosity of passengers and employees at the Airport will bring additional resources to the City's efforts to address homelessness." People can also donate by calling 311, or opting to round up their monthly city utility bills. In conjunction with the city's efforts to discourage panhandling, the Downtown Spokane Partnership, Catholic Charities, the city and Goodwill Industries of the Inland Northwest are partnering to help put those asking for money to work. Starting early next year, possibly as soon as February, a staffed van will offer work to people asking for help, and in exchange offer them meals and a stipend or gift of some kind. They're calling it "Hope Works," and largely drew inspiration for the program from Albuquerque's "There's a Better Way," which started doing the same thing in September 2015. Since then, New Mexico's largest city has provided 4,240 day jobs for people and connected hundreds with needed mental health, housing, and substance use services. In Spokane, Hope Works will put people to work in similar day-labor jobs emanating from the downtown core, says Mark Richard, DSP president. Details regarding what jobs may be available are still being worked out, Richard says, but could include things like litter removal, seasonal planting and weed removal, cleaning graffiti and snow removal. There's an important distinction between Hope Works and the Albuquerque program, which offers an hourly wage for the day's work; Hope Works will focus on being a volunteer program that can help build work experience. "The real key is a lot of the individuals we’re going to be reaching ... many of them don’t have their IDs. We know this for a fact through other interactions," Richard says. "Many of them are also hesitant to engage with folks, in the sense of people who would love to put you to work, and need you to sign all these forms, and send that off to the government and get you set up as an employee. We know those are barriers." The program will have to be careful with how it offers any reward, to make sure it avoids that being "in lieu of wages," which could run afoul of state laws, Richard says. Other than meaningful work experience, the program's main goal will be connecting people with the services they need. "The idea is to build that relationship and the trust, so they might be inclined to make a stop at the end of the day back at Goodwill," Richard says, "so we can talk about, 'What are your barriers, and how can we help you get past those?'" Those who need help can be guided through the process to get an identification card, sign up for disability assistance if they qualify, and learn how to create a résumé, open a bank account, manage their finances and apply for jobs. "But our hope is that the biggest incentive is we’re providing you a low-barrier path toward a brighter future, where you no longer have to stoop yourself to begging for money on a street corner," Richard says. "I think there’s a good number of individuals panhandling who don't feel good about it, don't like begging for money. We need to show them there are other ways, there is opportunity for work out there." To get the program started, the agencies are raising funds, applying for grants, and contributing their own money to reach a $150,000 initial goal. In addition to funding from Catholic Charities and Goodwill, the Spokane City Council approved $37,000 for the effort on Oct. 9, and the Downtown Spokane Partnership and business improvement district will pitch in a combined $20,000 between 2017 and 2018. Still, the program needs about $10,000 more to be fully funded, Richard says. While the organizations wait to hear back on grant applications, they're also encouraging interested citizens to donate. People who want to donate can text "CHANGE" to 50555 to see a $5 donation to Goodwill Northwest on their next cellphone bill, which will go to the Hope Works efforts. The groups are also working on starting a GoFundMe page to help pay for the effort.